A 55-year-old man with diabetes and hypertension presented with sudden onset of transient somnolence. When he woke up, gait ataxia was noted. This was followed by recurrent fluctuations in consciousness and skew deviation. An urgent neuroimaging protocol for stroke demonstrated symmetric bilateral hyperintense thalamic lesions on diffusion-weighted MRI (figure), consistent with acute ischemic events and compatible with occlusion of the artery of Percheron. The large arteries of the posterior circulation, including the tip of the basilar artery, were fully patent on magnetic resonance angiography. Figure 1. (A) Diffusion-weighted imaging. (B) T2* gradient echo MRI. 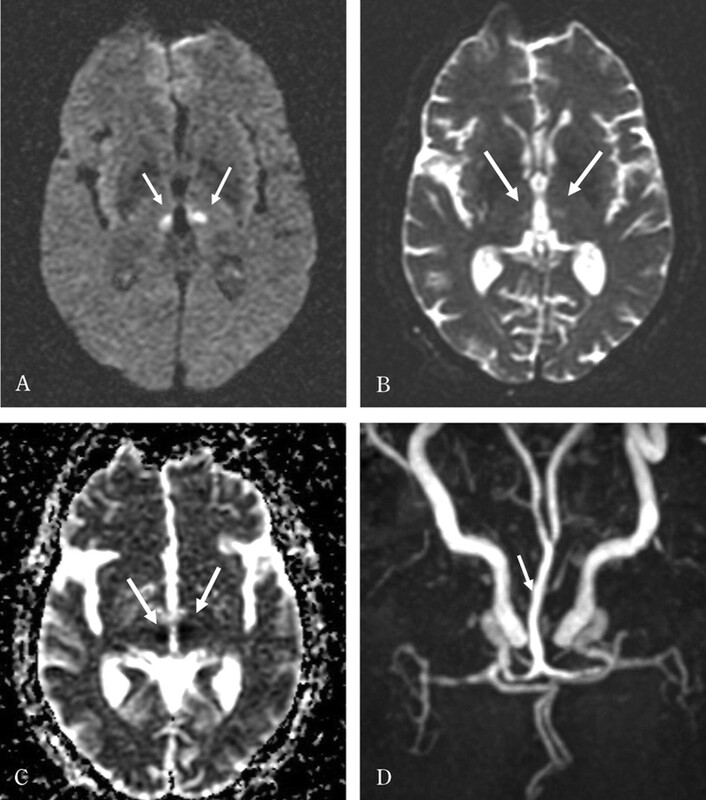 Images show abnormal hyperintense bilateral paramedian thalamic lesions (arrows). (C) Apparent diffusion coefficient image demonstrating the same lesions with diffusion restriction (arrows). (D) Magnetic resonance angiography demonstrating patent basilar artery (arrow) and posterior cerebral arteries. The central artery of Percheron arises from the first segment of the posterior cerebral artery and gives rise to bilateral medial thalamic perforants.1 Occlusion results in bilateral paramedian thalamic infarctions. This is one of the few examples where a cerebral blood vessel supplies structures on both sides of the midline. Received April 28, 2005. Accepted in final form August 2, 2005. Percheron G. Arteries of the human thalamus: II. Arteries and paramedian thalamic territory of the communicating basilar artery [in French]. Rev Neurol (Paris) 1976;132:309–324.